Misua guisado is sauteed Chinese vermicelli noodle where you could basically cook with any meat or vegetable ingredient that you like. The noodle strands are fine and easily breaks, and could easily clump up if you don't separate them in the first few minutes of cooking. The texture is soft and gooey when cooked, so it is used more in soups rather than sauteed or stir-fried. 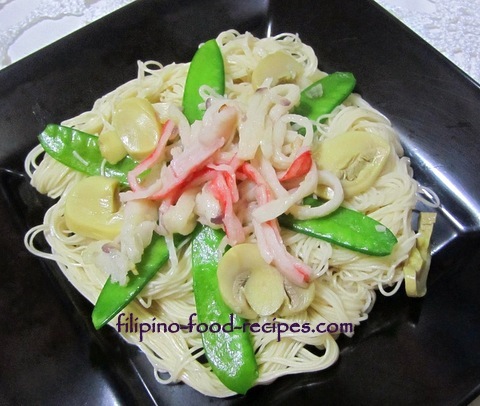 The noodle is also pale white when cooked so it is up to you if you want to add some soy sauce. But since I am using Knorr Shrimp cube which in itself salty, so there is no soy sauce in the recipe. I add some sesame oil in the end so the noodles will not stick together and become lumpy. If you don't like the taste of sesame oil, you could use a neutral tasting oil like canola just to keep the noodle strands separated. As for texture, I like topping with crushed or chopped peanuts. 1 Saute onion and garlic, and add the seafood mix and the crabsticks. 2 Stir in the sliced button mushrooms, and the snow peas. Season with salt and pepper and cook for 2 to 3 minutes. 3 Scoop out half of the seafood meat and vegetables (for topping), and set aside. 4 In the same pan, add the broth or Knorr shrimp cube with 5 cups of water. 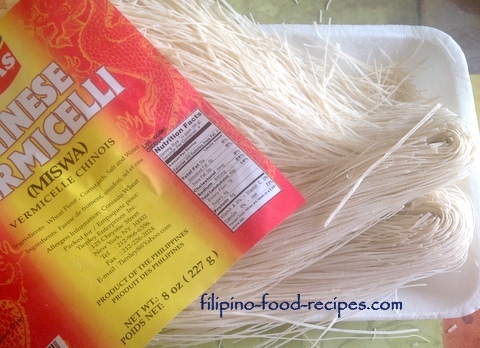 5 Bring to a boil, then add the misua noodles and cook until the liquid is fully absorbed by the noodles. 6 Turn the heat off and add the sesame oil(so the noodles will not clump up and stick together). 7 Arrange on a platter, putting the remaining cooked seafood and vegetable on top. 8 Finish off by sprinkling with crushed peanuts. 9 Serve hot with some crushed peanuts served on the side.